GODZILLA is now showing in cinemas everywhere and is distributed in Australia by Roadshow Films. There is just something about the giant, prehistoric lizard by the name of Godzilla that film makers see as an attractive challenge for themselves, and at the same time there is no denying it is a concept the public will always find enticing. This monster which terrorizes the major cities has inspired the imaginations of filmmakers and audiences alike since it's first appearance in the 1954 Japanese film Godzilla (Gojira). With each new film and television version, the makers have been faced with the constant dilemma of how to create the perfect monster film by achieving the right combination of amazing visuals, script and human character. 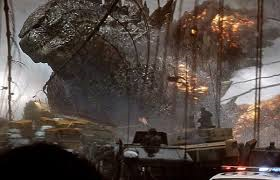 The 2014 Godzilla has come with high expectations, especially in regards to it's visual impact considering it has been made in a time when computer generated images are more impressive and realistic than they ever have been before. Visually it is incredible and Godzilla himself is the perfect prehistoric terror. It is the beast that is magnificent, and the humans that are the pitfall of the film. If this was a film purely about the beast, it would be a great deal more successful than it is while it is trying to be a combination of that and human emotion and survival. In Japan in 1999, a series of small aftershocks as a result of an earthquake in the Philippines are taking place and American Joe Brody (Bryan Cranston) is concerned that this activity could have a dangerous effect on the nuclear plant which him and his wife, Sandy (Juliette Binoche) work at. His suspicions are tragically confirmed when a disaster takes place at the plant and Sandy is among the fatalities. Fifteen years later, Joe and Sandy's son, Ford (Aaron Taylor-Johnson) is a US naval lieutenant and has just returned home to his wife, Elle (Elizabeth Olsen) and son, Sam (Carson Bolde) when he receives a call from Japan informing him that his father has been arrested for trespassing. Ford returns to Japan to bail out his father and return home as quickly as he possibly can, but Joe talks him into staying longer when he explains he was trying to get back to their old house as he believes the government are hiding something big. Joe and Ford find that they are in fact hiding something which they would do anything to not let the world know about, but it is only with Joe and Ford's help that they realise that there is an even bigger threat out there in the Pacific Ocean waiting for it's chance to surface. The first 20 minutes of Godzilla gives the impression that this time they may have got it wonderfully right this time. The beginning sequence in which there is a montage of news stories and footage which end with a black and white shot of Godzilla stirring in the ocean is the perfect way to start the film as it pulls in the audience and creates intrigue and suspense as well as a slight nostalgic atmosphere. It is in this 20 minute time period of the film where the spectacle, screenplay and acting really create something special. The scene when Joe loses his wife is absolutely heartbreaking. There is a great deal of human emotion and Bryan Cranston is absolutely superb and Juliette Binoche brings the very best to her brief time on screen. When the film reaches into the future, it still maintains it's high standard for a period of time. It is when the beasts appear that the interest in human emotion and relationships tend to lessen. Admittedly, the film is first and foremost about Godzilla and past Godzilla films and television shows have been more about the spectacle and action rather than the human side of things. However, this wouldn't have been as much of a disappoint if the first 20 minutes hadn't set the film up for a perfect combination of everything a film needs to be a success overall. The film after this period of bliss starts to consist of weak human relationships, emotions and restrictive acting, and not nearly enough Godzilla. In order to make this Godzilla different story wise to past Godzilla's, writer Max Borenstein has obviously tried do something that hasn't been done before. In this case, it is not only Godzilla who is the only prehistoric creature in the film, but there are two other spider like reptile creatures which are called MUTO's which are fed by radiation. These MUTO's appear in the film a great deal more than what Godzilla does and even though these two creatures are interesting to look at, they do not compare to Godzilla. Godzilla truly is a sight to behold. The CGI which has gone into making this creature is truly amazing. Every little detail of him down to every scale on his body has been immaculately created. The size of the beast is magnificent and when situated next to landmarks such as San Francisco's Golden Gate Bridge makes him even more terrifying. Alas, there is really not enough of him as opposed to the MUTO's, who are nowhere near as impressive. The set design, especially that of the deserted Japanese town and the railroads, is also rather exquisite and impressive. Bryan Cranston and Juliette Bincohe are indeed the stand-outs performance wise in the film. The other two actors who also should have given beautiful and emotional performances are Aaron Taylor-Johnson and Elizabeth Olsen. However, their performances are lack lustre and this is no fault of their own. Both actors have given incredible performances in the past and there is no doubt they are fine actors. Yet their roles in Godzilla are ones that call for emotion and depth, but both fall short. It really is uncharacteristic of the two actors and fault falls more on the way in which Gareth Edwards directs them as it really feels like the two have been restricted. Ken Watanabe's role as Dr. Ishiro Serizawa by all means the corniest. Every line he says is just so typical of his type of character in such a movie. It is as thought everything he says is a revelation or sorts and you cannot help but snicker when he announces "And we called it....Godzilla"
Godzilla is, just like the beast itself, a spectacle. 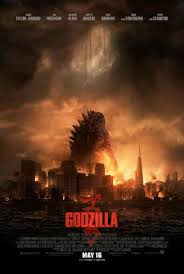 The film gets your hopes up in a huge way at the start, but lets you down little by little with the weakening of the humans emotionally and nowhere near enough of Godzilla itself.